Southern Illinois University Edwardsville Library and Information Services (LIS) has published a new digital collection, featuring work done as part of the Illinois River Project (IRP) and the vision of emeritus professor, Robert A. Williams, PhD. Meanderings is an environmental teaching journal dedicated to the study of rivers in American culture and of the environmental health of rivers. It originated as a print publication of the SIUE School of Education, Health and Human Behavior (SEHHB) from 1990-2005. An interdisciplinary publication combining scientific literacy, writing, literature and art, Meanderings features participation by and contributions from school children. Meanderings resulted from the Illinois Rivers Project directed by Robert A. Williams of the SEHHB. Williams joined the SIUE faculty in 1973 as an instructor in elementary education and enjoyed a distinguished teaching career. He retired in 2001 as a professor in the Department of Curriculum and Instruction. In addition to his formal University teaching activities, Williams enjoyed using the Edwardsville campus as an outdoor classroom where he instructed hundreds of school children about the natural environment. 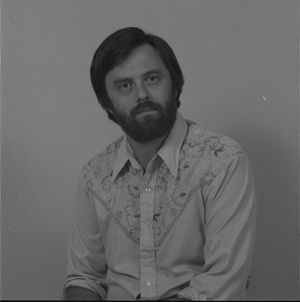 Stephen Kerber, University Archivist and Special Collections librarian, conceived the idea for the Meanderings digital collection. Education Librarian Matthew Paris authored the introduction in collaboration with Fine Arts Librarian Therese Dickman. For more information, view Meandering and the Illinois Rivers Project. The SIUE Library and Information Services (LIS) consistently strives for new and inventive ways to deliver information to students, faculty and the community. LIS is home to Lovejoy Library, the heart of the University. The library provides SIUE faculty and students with trustworthy information required for their academic pursuits that result in improving our communities. LIS faculty and staff nurture SIUE students’ scholarship with resources that support the collaboration and innovative thinking needed to succeed in the global marketplace. SIUE emeritus professor Robert A. Williams, PhD.